The iridescent nacre inside a Nautilus shell. Nacre (/ˈneɪkər/ NAY-kər) an aa kent as mither o pairl, is an organic-inorganic composite material produced bi some molluscs as an inner shell layer; it is an aa whit maks up the ooter coatin o pairls. It is strang, resilient, an iridescent. 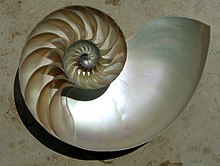 ↑ Definition of nacre at dictionary.com. This page wis last eeditit on 29 Apryle 2017, at 23:26.